Client Relationship Management (CRM) and Enterprise Resource Planning (ERP) are two sides to one profitability chain. Both CRM and ERP’s main function is increasing overall profitability in a business. Successful organizations need these software’s to help clients drive key business tasks, make sharper and more rapid decisions, and ensure they make the most of their benefits and resources. CRM and ERP can be integrated with others and coincide in some areas. However, their core functionalities are entirely different. As a result, it is most useful for companies to look at the two separately as stand-alone systems. This makes it easier to distinguish how CRM and ERP play a role in increasing productivity and sales growth. CRM, as stated previously, stands for customer relationship management. It’s a category of combined, data-driven software solutions that enhance how organizations interact and do business with their customers. CRM systems help teams manage and maintain customer relationships, track sales leads, marketing, pipeline, and deliver actionable data. It increases profitability for businesses by being able to streamline administrative processes in sales, marketing, and service divisions. This allows organizations to focus on building and maintaining customer relationships that matter. A strong CRM solution is a complex platform where everything that is stored is crucial to developing, improving, and retaining customer relationships. Without having the support of an integrated CRM, organizations could experience a missed growth opportunity or loss of revenue because they’re not optimizing the operating processes, making the most of customer relationships, or sales leads. Microsoft Dynamics CRM provides a standardized approach for collections and sharing customer data and categorizing customer interactions. CRM is a collaborative environment within a business because it can be accessed by everyone throughout the entire sales process. The main goal of CRM is to provide a complete outlet of customer data that can be used to increase sales, improve customer retention, and make customer relations more efficient. Once a potential lead becomes a client, it then becomes a matter of ensuring the relationship is maintained to repeat business by increasing orders or increasing value. ERP, previously stated as well, stands for enterprise resource planning (ERP). It’s a business process management software that controls and incorporates a company’s financials, supply chain, operations, reporting, manufacturing, and human resource activities. Most companies have a form of finance and operational system in place, but most software elements out there can’t go beyond everyday business processes or help with future business growth. A company’s needs expand and need change and their systems should be consistent with that. ERP is used to administer the business management side to improve the productivity of business processes. Similar to CRM, ERP establishes a rapid sharing of regulated information throughout all departments that play a role in the sales process. This creates a real-time, enterprise-wide snapshot as employees are able to enter information into the ERP system. If there are any problems in specific areas, an alert will automatically be sent to others affected so departments can plan for issues before they become a major problem. 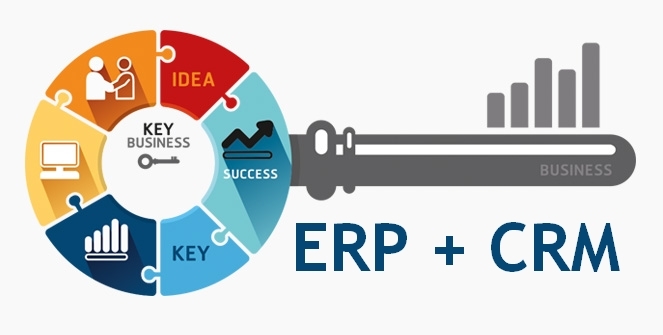 ERP provides an approach for streamlining business processes across the board. For example, Microsoft Dynamics NAV and Microsoft Dynamics for Finance and Operations can directly coordinate with Microsoft Dynamics 365 for Sales. CRM and ERP use different approaches to achieve a similar end goal, increasing profits. CRM’s main focus is increasing profits as a result of producing a greater sales volume. ERP focuses on the reduction of overhead and cutting costs, and by making business processes more valuable, ERP reduces the amount of investment spent on those processes. Companies still wonder which system should be implemented first as they want to maximize their growth. Both have unique advantages, but most companies must increase sales and profit which directs them to a CRM system. However, an ERP system drives business with specific and accurate data within the different departments. Organizations must have profits, in order to cut costs and business process are only possible when there is a consistent sales revenue. In conclusion, most organizations need both CRM and ERP. Why? A CRM system drives sales while the ERP system maximizes business growth. Are you looking for one or the other? Or maybe if you are looking for both. If you need a consultant or you need more answers, contact us today to solve your business needs and we will help you increase your profits.